Photo ; CLICK to enlarge. 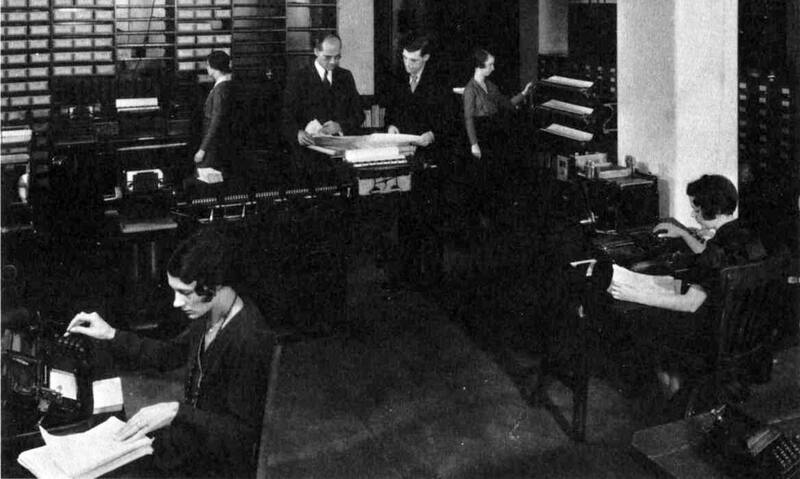 The caption for the same photo in  reads "Benjamin D. Wood, center left, and staff members of the Columbia University Statistical Bureau in the early 1930s operating IBM machines donated by Thomas J. Watson Sr." You can see some non-IBM desktop calculators (probably National or Burroughs) at lower left and middle right. A 285 tabulator is at left center. In the extreme lower right is a non-electric IBM Type 001 key punch. 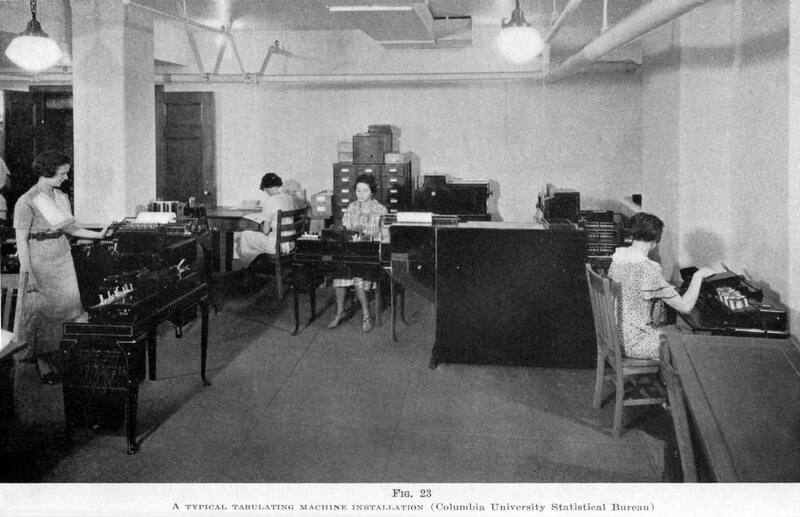 The Statistical Bureau began after Columbia University Statistics Professor Benjamin D. Wood wrote to Watson in 1928 describing his ideas for an automatic test-scoring machine. In their first meeting, Wood also discussed his futuristic ideas for electronic data processing in education; Watson liked the cut of Wood's jib and ordered three truckloads of tabulating, card-punching, sorting, and accessory equipment dispatched to the space Wood had procured in the basement of Hamilton Hall. 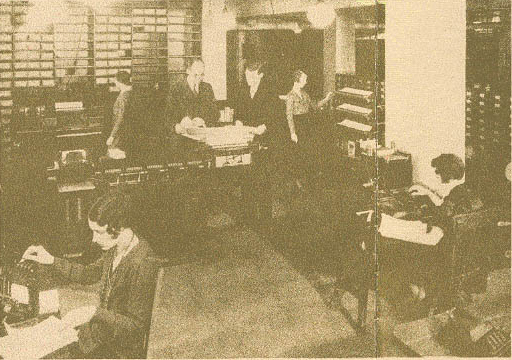 The Statistical Bureau opened for business in June 1929. I remember going there soon after it was set up and watching the machines. For an astronomer who had been doing computations the hard way it was a great experience to see an accounting machine adding quantities in different counters at the rate of 150 a minute and printing the results, and sorting going on at a rate of about 20,000 cards an hour. Unfortunately, records of the Statistical Laboratory have vanished, so we don't know what other work was done there. I would be surprised, however, if the pioneering work of Franz Boas in debunking racial myths through massive collections of numerical data did not rely on Wood's machines for data reduction and analysis. Brennan  says the Bureau also served external clients: the Rockefeller and Carnegie Foundations, publishers, economists, and other universities including Harvard, Yale, Princeton, Chicago, Pittsburgh, Ohio State, and the University of California. As powerful as the Bureau's machines were for their day, they were not well suited for the higher-level statistics that Wood needed. In 1930 he convinced Watson to have IBM build a "supertabulator" capable of the "difficult mathematical processes necessary for the analysis of educational and psychological tests"  (i.e. SUBTRACTION¹, and some additional counters ). The result was a unique device called the Difference Tabulator and informally known as the Columbia Machine. 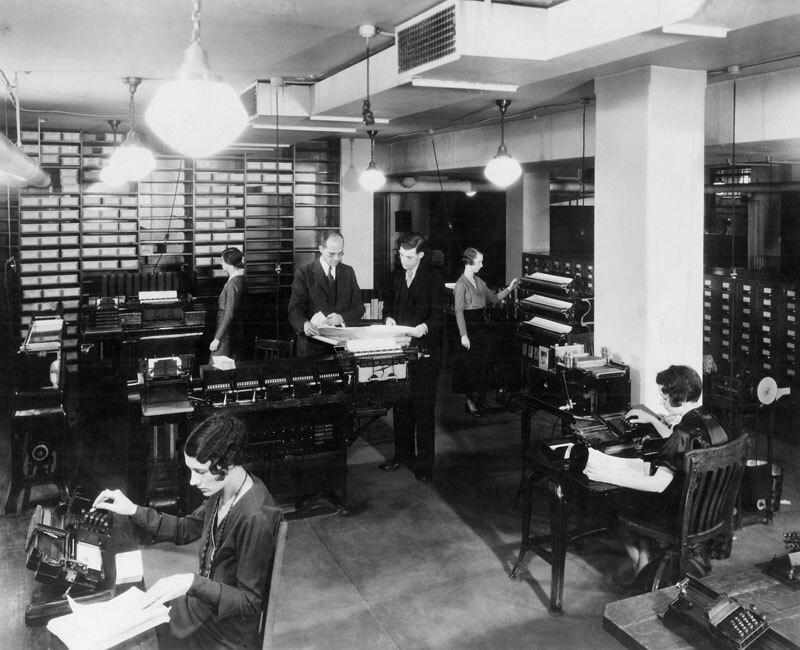 Later Wood would work with IBM yet again to develop the world's first automated test-scoring machine, the IBM 805, announced in 1937. Equipment includes an intepreter (left foreground); key punches (center and right). The large object with its back to us, right center, is an IBM 285 tabulator. Another 285 appears in the left middle ground with the roll paper. (the 1 carried out of the high-order position is added back to the result, giving the proper result, 673). Bashe, Charles J.; Lyle R. Johnson; John H. Palmer; Emerson W. Pugh, IBM's Early Computers , MIT Press (1985). Eames, Charles and Ray, A Computer Perspective: Background to the Computer Age , Harvard University Press. First Edition 1973; Second Edition 1990. .
Wood, Ben D., "Analysis of College Test Restults", in Baehne, George W. (IBM), Practical Applications of the Punched Card Method in Colleges and Universities , Columbia University Press (1935).